NASCAR Driver to Meet Fans & Celebrate the Gift of Life - LifeLink Foundation, Inc.
LifeLink® of Georgia and Donate Life Georgia to host NASCAR XFINITY Series driver Joey Gase to honor organ, eye & tissue donors. AUGUSTA, GA (February 1, 2019) – Following his mother’s death in 2011 of a sudden brain aneurysm, NASCAR driver Joey Gase made the decision to donate her organs, eyes and tissues, which ultimately touched the lives of 66 individuals in desperate need of a transplant. Since then, Gase has become as passionate about donation as he is about racing. In December 2015, he was awarded NASCAR’s inaugural COMCAST Community Outreach Award for his work supporting organ, eye and tissue donation and donor families. MBM Motorsports is excited that Gase will pilot the No. 35 entry in the 2019 NASCAR XFINITY Series season. Atlanta Motor Speedway will soon fill its 110,000 permanent seats with motorsports fans. Meanwhile, over 113,000 men, women and children across the country are waiting for the gift of life through transplantation; over 5,200 wait in Georgia. For the upcoming Rinnai 250 at Atlanta Motor Speedway, Gase will race the LifeLink® and Donate Life Georgia #35 car in honor of his mother and others touched by donation and transplantation, like Drew Passmore. Drew was a passionate young man who never met a stranger, and made a positive impact on many throughout his seventeen years. He loved sports and hunting. An active member of Warren Baptist Church, he did much more than just attend services. He loved to lead and serve others through bible studies, mission trips and through his relationships. Drew passed away in 2017 after a single car accident, and Drew’s legacy continued as he saved four lives through organ donation. Drew’s picture will be placed on the back panel of the #35 car as a tribute for those whose lives were forever changed by his family’s decision to donate life. On Thursday, February 21, 2019, Gase will visit Augusta Christian Schools, where Drew was a student and athlete, to share his personal experience as a donor family member and honor the life of Drew, and donor families in general. Recipients, donor families, and registered organ donors will be invited to sign and make handprints on Gases’ #35 car during a special event called “Handprints of Hope.” The personal tributes to organ donors, transplant recipients, those waiting for a transplant and healthcare professionals will ride with Gase on the track during his race as an inspiration for fans about the power of donation. Members of the community are also invited to attend. 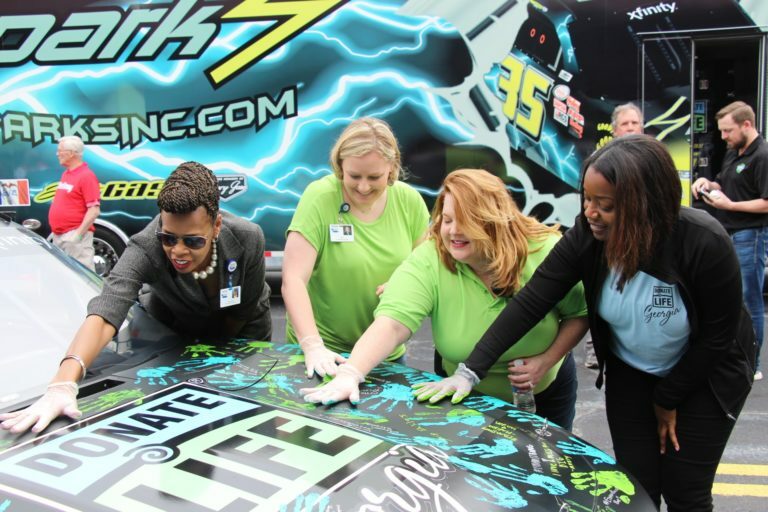 WHY: Meet and greet with NASCAR driver and Donate Life advocate, Joey Gase, to unveil LifeLink and Donate Life Georgia #35 car with “Handprints of Hope” event to honor organ and tissue donors, including Drew Passmore. WHO: Interviews available with Joey Gase, NASCAR driver and Community Champion Award winner, donor families, transplant patients, recipients and Donate Life advocates. LifeLink of Georgia is a non-profit community service organization dedicated to the recovery of organs and tissues for transplantation. Learn more by visiting www.LifeLinkFoundation.org. Connect with us socially on Facebook, Twitter, and Instagram. Donate Life Georgia (DLG) is a statewide alliance formed to educate the public about organ, tissue and eye donation. DLG is one of 50 non-profit local coalitions affiliated with Donate Life America and works to spread a unified message to Americans about the importance of organ, tissue and eye donation. MBM Motorsports was created by Carl and Dee Dee Long who then partnered with Derek White, James Carter, and John Jackson. They now run their own engine program made possible by Rocky and Tom Smith. MBM Motorsports runs the Toyota Camry in the NASCAR Monster Energy Cup Series and the new Toyota Supra in the NASCAR XFINITY Seriess.